I don’t often use pain relievers, but I was recently offered a chance to test a product called MuscleCare. It came in 2 forms, one was your typical gel and the other (my personal favorite) was a roll-on! So… first things first, I needed to put myself in some serious pain. I geared up and hit the Great Lawn in Central Park. Coach S. had assigned me some sprint intervals that day which seemed perfect to generate some muscle pain. The workout consisted of 5 intervals; 3 minutes at a 6 minute pace followed immediately by 5 minutes at an 8 minute pace. They were pretty brutal, but I love these kinds of drills. My total mileage was around 6 miles and by the time I had finished I was on fire. I slowly slogged home, anxious to have dinner. My legs were toast. Back home, I grabbed a shower then applied the roll-on MuscleCare to my quads and calves. I was really impressed with how quickly the roll-on took to apply and I didn’t have any goop on my hands like when using Tiger Balm. Also, Tiger Balm smells like Vicks Vaporub and makes me nauseous every time I smell it, like in the start corrals of a race. As I started cooking dinner my legs had this tingly coolness set in. I wondered if I was going to collapse as my muscles went numb, dinner still cooking and me unable to reach up to it. This did not happen. Instead the MuscleCare really did work at relaxing my muscles. I’m not going to go as far as to say ALL of my self induced muscle pain was gone, but my legs felt great. The following day my legs were not nearly as trashed as they normally would be and that in itself is worth it for me. 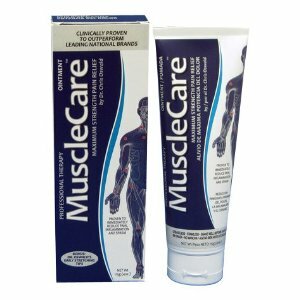 “MuscleCare is an all natural topical pain reliever (containing no parabens, wax, petroleum or colouring agent), which comes in a 3 oz roll-on and an ointment. The active ingredient in MuscleCare is Magnesium, which elicits the relaxation of arterial smooth muscle and aids in enabling skeletal muscle to relax.